The Three Principles are the foundation behind the creation of all human experience. Anyone can learn these Principles. Learning these Principles can raise your overall level of well-being. What is a Three Principle Mentor? A Three Principle Mentor is someone who is a trusted guide to gently point you toward discovering for yourself the keys to how all human beings operate. People often ask if the 3 Principles are the same as or different from current and popular spiritual teachings, or Buddhism, or any of the world religions. In this blog I will attempt to answer this important question. The 3 Principles refer to the essence of spiritual truth. This truth lies at the core of all of life or we would not refer to it as truth. It has revealed itself to people throughout history. This truth is not the sole province of any person, or spiritual understanding, or religion. Principles in this context do not refer to any concept or idea, but refer to that which is most fundamental to life. That which is most fundamental is the energy of all of life, whether in form or formless. Another way of saying this is that out of pure, formless energy everything in all the universes arises and takes form. Since any and all form is composed of that same energy, there is an inherent unity or oneness in life. Everything is the same energy, whether in form or formless. This truth has always been true, even long before humans came along. Syd Banks was fortunate enough to have had a realization of this truth in its starkest simplicity. What revealed themselves to Syd in 1973 were the 3 Principles in their formless essence. It was clear to him that they lie before the forms that they have taken in different religions and cultures. Therefore, Syd asserted that the 3 Principles are found at the formless, spiritual core of Buddhism and at the core of every religion. He also pointed out that often the essence of truth gets more and more covered over by concepts, ideas, beliefs, insights, values, doctrines, advice, practices and techniques as time goes by. Syd was concerned with the way in which the simplicity of truth can be diluted by human beings as they mix the principles with personal concepts and practices. He knew that this was a danger within the community of people calling themselves 3 Principle practitioners. Syd was doing his best to invite all of humanity to look toward the essence of every spiritual teaching and religion. He honored and had great respect for all religions. He encouraged religious people to stay with their religion. He invited people to strip away the complexity and return to simplicity. He knew that every single human being has the ability to realize truth. He knew that if people gained a deeper realization of the essence of their religion that it would enhance their understanding of that religion and would help raise the level of understanding in the world. So the real question may not be how the 3 Principles are different than other spiritual teachings, but can we recognize the 3 Principles at the core of all spiritual teachings and learn to separate them out from all that is a conceptual elaboration? Syd believed that he did not create or discover these Principles. They are eternal Principles that revealed themselves to him. The formless nature of spirit and our intimate connection to that world is what Syd shares in common with other spiritual teachers and teachings. But every spiritual realizer brings their own emphasis, interpretation, and explanation to their teaching. 1) Sydney’s spiritual awakening happened through spontaneous insights. Because of this Syd never recommended, or felt the necessity of, spiritual practices, disciplines, or techniques. This in my opinion truly sets Syd apart from the vast majority of spiritual teaching. The very first point Syd makes in his book The Missing Link is: “One of the greatest misconceptions ever is the belief that ‘It takes years to find wisdom’….The achievement of mental stability and peace of mind is one thought away from everyone on earth…” The accessibility of this has given hope to countless thousands of people. 2) Syd articulated the 3 fundamental life forces that he called Principles that are the universal common denominators of all human psychological experience. The identification of these 3 universal Principles brings a clarity and simplicity that immediately cuts through differences of race, culture, status, and age. He always pointed people toward simplicity rather than complexity. 3) He defined the essence of the Principle of Thought as formless and included Thought in his trinity along with Mind and Consciousness. He often called Thought the “missing link” for humanity, because a lot of spiritual teaching focuses on the Principles of Mind and Consciousness and they don’t highlight Thought as an equal Principle. Thought is the link that connects the spiritual with the psychological worlds. 4) Syd insisted that 100% of all feeling and experience was created from the Principles, and that we are all lived by the same principles, no exceptions. 5) He was emphatic that no person is wiser or more spiritual in their essential nature than anyone else. Therefore he felt that everyone already has everything they are looking for. His notion of innate health completely undermines the long-standing trend toward self-improvement or self-development. 6) Syd’s certainty that if you touch the inner space prior to our conceptual mind, the state of no thought, that it must manifest as a positive feeling and/or a higher order of thinking. 7) He consistently pointed out the danger of being a follower of a teacher, rather than trusting your own wisdom and following your own common sense. One of our beautiful golden retrievers who was suffering from cancer and could no longer move had to be put to sleep by our vet. Our dog was such a lively dog who unconditionally loved each of us for the 12 years of her life. Every time she would see one of us coming she would squeal with joy. If you have ever lost a close family pet, I am sure you can appreciate the range of emotion we all felt, from love and gratitude to deep sorrow and grief. I will never forget the image of my grandson Jacob with his face buried in his dog’s ear, racked with sobs as he gently touched her with so much gentleness and kindness. Through my own tears I felt such love for both of them at that moment. As a student of the 3 Principles for 27 years I have learned the beauty of allowing all thoughts and feelings to flow through me freely. My teacher Syd Banks taught us that we don’t have to be frightened by any of our experiences. The play of thought is constantly bringing us a wide array of feelings. When we understand that this wide array is the play of the Principles we can appreciate this dance created by the spiritual energy of life. No thought or feeling in and of itself can hurt us psychologically if we don’t struggle with it. We struggle with our experience when we judge it, try and resist or stop it, try to manipulate it, or wish we weren’t having it. It is this struggle against the already created thoughts and feelings that creates the problem. It is this struggle that takes us out of the now and gets us entangled in the apparent reality of our thinking. It is this struggle that blocks the arising of our next thought that will shift our feeling. After our dog died, Jacob stopped crying, went outside to ride his bike, and then he came back to her grave in the backyard and start crying, then he was angry and demanding, then he was back happily riding his bike. Left alone, struggle free, our wisdom keeps shifting our thinking in a healthy direction. This is how the wisdom of our mind guides us to healing. When we understand that all feelings are just the natural creation or play of spiritual energy manifesting, then we can let it be and allow it to shift and change on its own. This shift happens naturally and is guided by the intelligence, or wisdom, behind life. When grief and loss and sorrow wash through us unimpeded and without judgment we experience these feelings as the natural and beautiful flow of life. When our understanding of the play of thought allows us to stand open and receptive in the face of any thought whether of love or grief, and it flows through us naturally, then a deeper unconditional love arises that embraces all of life as it is and it flows out of us to touch those around us. 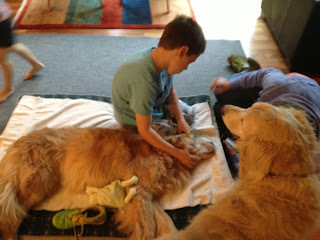 And I know that the deep love we felt for our dog and each other was both uplifting and healing. We all fall in love. and it leaves us undistracted and present to life. This is ordinary and experienced by all. yet we rarely realize the power and magnitude of this space. For centuries mystics have called this inner space, Consciousness. We can all sense and intuit this space. It is the very essence of the sense “I exist”. It is the deepest sense of just being. we can sense this Silence, this I Am. This is the always-present backdrop to our experience. Some call it the eternal Witness, or Awareness. Some call it Presence…our presence…God’s Presence within us. Some call this our Soul…our True Self…Home. Little self merges into big Self. A river merges into the ocean…the Ocean of Consciousness. all of life is created. Touch this space and our consciousness rises. We will see anew with more and more love and understanding. and we discover a new world of love and understanding. We fall into the Heart of the Universe and discover it is our heart. A good friend of mine was talking to me about a problem at work. He was thinking about the problem, the role other people were playing, and his experience dealing with this problem. As he shifted from subject to subject I could see his feelings change accordingly. He was disheartened. As he talked he went from feeling bother to frustration, to confusion, to anger, all of which are forms of stress. The Principles are simple. Understanding them reveals what is true in each moment. For example, whatever we are thinking right now, we will feel. We are free thinkers. We are free to think about any subject in the world. But we will always feel the thoughts we are having about our subject. At any moment you could say that one of two things is going on for any of us. Either we are aware of the Principles, e.g. right now I am feeling my thinking, or we are not aware of the Principles, e.g. right now I am so engrossed in the subject that I am thinking about that I am not aware that what I am thinking is creating a feeling. In each moment we understand the Principles or we don’t. This is true for me, for you, and for every one of us. As my friend talked to me about his problem, he was so engrossed in the subject that he was completely unaware that he was thinking up his own stress. Consequently, he thought that his discomfort was because of what was happening at work. He believed that whatever he was feeling was justified by the problem. As he was analyzing he was unaware of the Principles and didn’t realize the way in which this thinking was creating more and more stress. Thinking up stress is like picking up a hammer and repeatedly hitting yourself on the head while talking about a problem. You are in pain but you are oblivious to the hammer. Thought recognition is seeing yourself hammering your head, realizing the connection between hammering and your pain, and then setting the hammer down. Setting the hammer down is not a technique. It is a built-in human response to realizing the true source of your present moment stress. There are many times when I am thinking about a subject or an idea and I am so engrossed in the idea that I don’t see the fact of Thought creating my experience in that moment. As I became more aware of the Thought-feeling connection, my focus shifted from the subjects in my mind to the effect my thinking was having on me. I was shocked to see how much of my thinking was creating stress, e.g. seriousness, discomfort, anxiety, uncertainty, and subtle tension. When I see that I am thinking up this stress I don't tend to continue to think about the subject at hand. With awareness it drops away. More and more of my thinking has been dropping away leaving my head open and clear. Being aware of the fact of Thought allows me to see the pain- inducing hammering I am doing. This understanding allows the hammering to subside or stop. I start to feel better and think better. A mind free of stressful thoughts is the gateway for the automatic arising of fresh thinking. This creates feelings of well-being, higher level perspectives, and solutions to our problems. This kind of thinking does not create stress. I reminded my friend of the role Thought was playing in his current stress and of the in-built potential for new thinking. As he realized this, his stressful thinking fell away. I saw him lighten up considerably. Right away he started having his own insights into his problem. He continued to have more insights the next day as well. Stress is an invitation to wake up to the Thought-feeling connection. Realizing the Principle-based foundation of our feelings results in more of our stress-producing thoughts dropping away. And how rewarding it is when our well-being fills in the space left as this thinking clears away. Every one of us can begin to wake up from the enchantment with the subjects we think about. As we do, we see and set down the hammer of our stressful thinking!